Syracuse University Interim Vice Chancellor and Provost Liz Liddy today announced that Joanna Masingila has been selected to serve as dean of the School of Education. 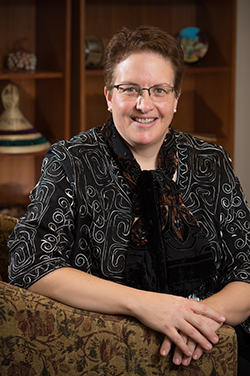 Masingila joined the Syracuse faculty in 1992 and has served as interim dean of the school since February 2014. A professor of mathematics and mathematics education, Masingila was previously the chair of the School of Education’s largest department, Teaching and Leadership Programs, and held a dual appointment in the College of Arts and Sciences. She has also chaired the Department of Science Teaching in the College of Arts and Sciences, served as program coordinator for the Mathematics Education Program and has coordinated the process for Syracuse University’s accreditation with the National Council for Accreditation of Teacher Education (NCATE) since 2001. During her time as interim dean, Masingila focused on maximizing existing resources through communication, transparency and community building. She initiated a forum for staff participation and appreciation, and created opportunities for faculty to report on and receive broader recognition for their work. Faculty in all ranks and disciplines have been supported in their roles as mentors and/or mentees through larger meetings and individual support. And, in concert with each member of the senior staff, Masingila developed strategies to be more effective and efficient in each area, including fundraising, finance, admissions and marketing. Consequently, she made it possible to provide extra grant writing support to all faculty. Masingila began her tenure at Syracuse University in 1992 as an assistant professor of mathematics and mathematics education in the College of Arts and Sciences and the School of Education. In the last two decades, she has risen through the ranks and collected numerous honors, including the Excellence in Graduate Education Faculty Recognition Award (2006) and the Martin Luther King, Jr. Unsung Hero Award (2005). She was named a Laura J. and L. Douglas Meredith Professor for Teaching Excellence in 2003 and a Gateway Fellow in 2002. In 1998, Masingila was a Fulbright Scholar to Kenyatta University in Nairobi, Kenya, and in 2011 she returned there as a visiting professor for six months. Masingila’s research interests include teacher development, teacher-educator development, mathematical knowledge for teaching teachers and students’ out-of-school mathematics practice. She has been the principal investigator or co-principal investigator on approximately $5.6 million in research grants, including six from the National Science Foundation and two from the U.S. Agency for International Development. She is widely published in journals and books, and has developed a number of multimedia case studies examining issues in teaching practice. Masingila is a graduate of Goshen College and Indiana University-Purdue University Indianapolis. She received a Ph.D. in mathematics education from Indiana University-Bloomington.